Midway through summer, a weeklong trip to Hong Kong with a friend saw the two of us venturing into one of China’s special administrative regions – Macau. What was initially a short day trip evolved into a two-day adventure. A former Portuguese colony, Macau is home to numerous heritage sites. In 2005, the Historic Centre of Macau was inscribed on the UNESCO World Heritage List. The stretch of UNESCO Heritage Sites include intricately built architecture, such as Senado Square, St Anthony’s Church, and the Ruins of St. Paul’s. On impulse, we booked a hotel room in Ole London Hotel from www.asiarooms.com (really good deals there, by the way), at SGD$80 a night. Ole London was more than decent, and was located just a stone’s throw away from the entire stretch of UNESCO Heritage sites. The innate adventurers in us planned to comb the entire stretch, and visit all twenty-odd sites. This was too lofty a task, as we realised on hindsight. That said, the places we visited awed us and left us wanting more. A melting pot where history meets modernity, Senado Square (Largo do Senado) is one of the four biggest squares in Macau. As part of the list that makes up the Historic Centre of Macau inscribed by UNESCO in 2005, Senado Square is a popular backdrop for many television shows. The fountain that sits in the middle of the square transforms into magical riot of colours when night falls. The intricately tiled floor, and the never-ceasing bustle of life around Senado Square always amazed me. By some odd habit of mine, I never seemed to get bored pacing the pathways; each step aligned to the beautiful wavy tiled floors. Yet another must-see attraction on the UNESCO list, the Ruins of St. Paul’s was originally a Catholic church. Ravaged by a fire and a typhoon in 1835, what is left of the church still stands tall at the top of a slight hill. The Southern wall, as depicted, contains intricately carved designs that survived both time and weathering. It was my second time visiting the ruins. Nonetheless, I left yearning for yet another chance to revisit the place. If you’ve got a soft spot for beautiful architecture laced with rich history and heritage, do reserve more time for touring these sites. Also, it felt strangely homely and familiar, as there were many Singaporeans with their unmistakable lahs and lors. Apart from its rich heritage, Macau houses one of the most visited hotels around, The Venetian. While situated quite a distance from Macau’s town centre, thousands flock to The Venetian to stroll along the Grand Canal Shoppes. Located at its basement, gondolas sail on the Grand Canal, complete with beautiful architecture and an artificial sky that will keep you spellbound. For a moment or two, it felt as though I was in another country altogether. A personal recommendation – visit Lord Stows’ Bakery while you’re there for its brilliant, freshly baked egg tarts. 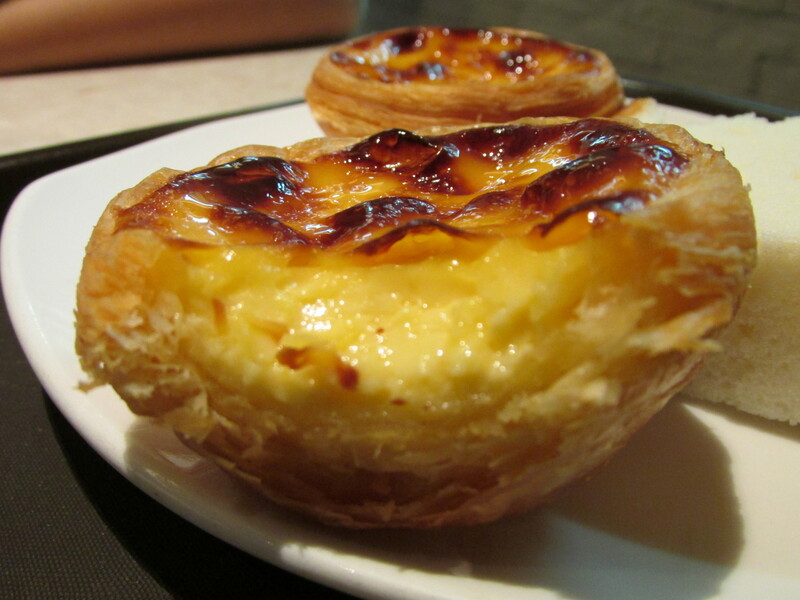 On the topic of egg tarts, Macau is also famous for its Portuguese egg tarts. Most egg tarts have a buttery, flaky shell, with a rich egg filling. Numerous bakeries and cafes fight over boasting rights for the best egg tarts in Macau. The above mentioned Lord Stows’ Bakery is one of them. A quick search online or a quick ask-around with the locals will surface two other bakeries – Margaret Café e Nata, and Kok Kei. Personally, I’ve never been to Margaret Café, but I did have a lot (and I really do mean, a lot) of egg tarts from Kok Kei. Kok Kei bakeries dot almost any tourist street you step on. A slightly less pricey option with a little more homely feel compared to Lord Stows’, Kok Kei does offer great egg tarts at rather accessible locations. Whichever bakery you choose to go to, the baseline: try Macau’s egg tarts. Period. Another thing that made Macau magical for me was the fact that we did not have to visit a particular attraction to be awed by its architecture. 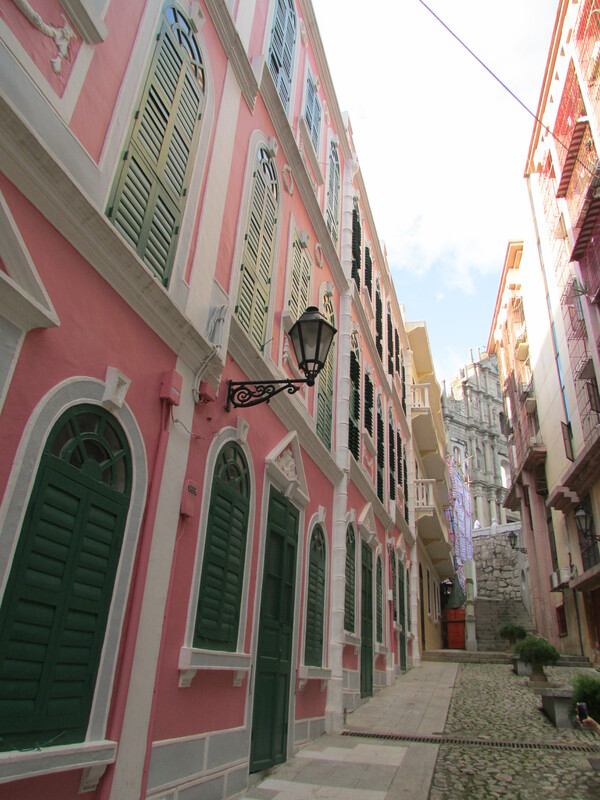 The streets of Macau were in itself rich with heritage and beautiful architecture. It was fascinating to stumble on a street where its walls were covered with graffiti art. Or walking by an alleyway with brightly painted walls and windows – the not commonly featured “Lover’s Street”. Even taking a stroll through the old, worn-out streets and buildings and streets of Macau will leave you wondering what beauty lies hidden amongst the quietness. With its great food, awe-inspiring architecture, and rich heritage nestled beneath the cover of bustling city life, Macau’s magic has won me over.